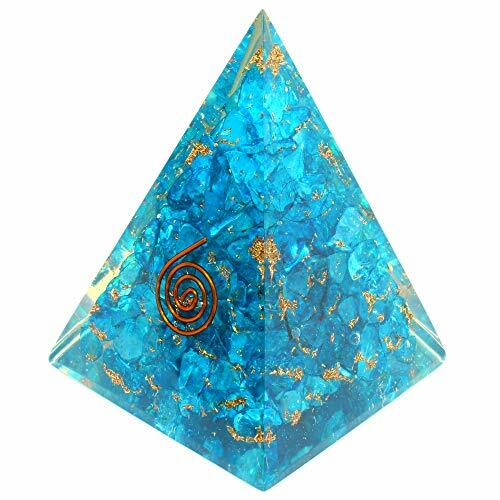 Orgonite pyramid helps to filter and balance energy fields in our environment and aid strengthening your body by converting the low frequency into higher frequency energy that is more beneficial for life forms including yourself, pets and plants. Why Orgone Pyramid is So Special? Let's have a look below! ✔Our Energy Generator Orgonite- is made on the same technology as Wilhelm Reich's Orgone Accumulator. ✔100% Certified Genuine Material- Blue Crystal Onyx ( Aquamarine ), natural CHAKRA CRYSTAL with no composites, Metal and other Specific vibrative Stones. ✔Chakra Balance-Aquamarine crystal clear your bodies energetic blocks and balance your Chakra. ✔Get Ocean Energy for calmness-Aquamarine is a stone that has ability to impact the energies of ocean and used to bring unfinished business to conclusion. This stone is also calm the mind and invoke tolerance toward others. Aquamarine represents purpose and serenity. ✔Mastering Orgonite Positive Energy- by simply place our ORGONITE CRYSTAL PYRAMID in your home or being near these devices you will feel lots of positivity. In reality, you will dive into a large amount of Orgonite positive energy ocean. This is also known as Chi, Prana, and Zero point energy.